Sportin’ Life represented the second career peak for Weather Report after Heavy Weather. Featuring the incredible rhythm section of Victor Bailey on bass and Omar Hakim on drums, the band’s penultimate album showcased a line-up that had been building up a real head-of-steam since their debut on 1983’s Procession. It’s not clear whether Zawinul named the album after the character in Gershwin’s Porgy And Bess but it wouldn’t be a surprise. The vitality of the music on offer here belies the fact that co-leaders Joe Zawinul and Wayne Shorter were aged 53 and 52 respectively when it was recorded. 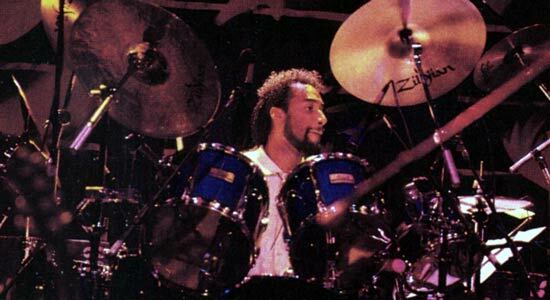 Hakim was playing with David Bowie, Sting and Dire Straits while making this album, and he brought undeniable star quality to Weather Report. Sportin’ Life blew my mind when it came out in ’85. I was already a huge fan of Jaco-era Weather Report and could hear how their music had influenced my other favourites Level 42, Sting and Joni Mitchell, but this was something else altogether. And to say my drumming was influenced by Omar’s playing would be a gross understatement. While Zawinul is very much in charge on Sportin’ Life (‘Hot Cargo’, ‘Indiscretions’ and ‘Ice Pick Willy’ are basically solo pieces), Wayne has returned to his best form, ex-Miles percussionist Mino Cinelu gets a lot of space and sounds as inventive as ever and Hakim has become a beautifully tasteful drummer. Bobby McFerrin and two other vocalists also contribute intriguing musical colours. ‘Corner Pocket’ may be the best-ever Weather Report album-opener, and that’s saying something. Over a superb drums-and-bass groove (possibly influenced by Trouble Funk/Chuck Brown? ), Zawinul delivers a typically arresting, swinging melody and unhinged synth solo. The rhythm section gear-change when Shorter tears into his tenor break is perfectly judged. ‘Face On The Barroom Floor‘ is a wonderfully enigmatic Shorter ballad featuring possibly the composer’s finest soprano playing on a Weather Report album. He lets rip here with some impassioned blowing over Zawinul’s moody synths with an uncharacteristically wide vibrato reminiscent of Sidney Bechet. The cover of ‘What’s Going On’ is funny and touching with Omar’s delicious half-time shuffle deftly moving between sticks and brushes. Cinelu’s delightfully Santanaesque ‘Confians’ closes with another joyous Shorter soprano solo, one of his most resplendent in latter-period Weather Report. It’s a shame there wasn’t much of an American audience for this kind of jazz in ’85, especially since Sportin’ Life represented a new high for Weather Report. Unfortunately the band didn’t tour the album – their last major tour came around the release of ’84’s Domino Theory. I saw them at the Dominion Theatre in London and vividly recall the intense interplay between Zawinul and Hakim. Shorter and Zawinul would soon go their separate ways but not before leaving us with this last classic. Dig it. This entry was posted in 1985, Album Reviews, Fusion, Jazz, Weather Report and tagged joezawinul, omarhakim, victorbailey, wayneshorter, weatherreport. Bookmark the permalink.